HISTORY - The first known European to traverse this district was Ludwig Leichhardt, who named the Expedition Range, Albinia Downs and the Brown River (after Harry Brown, an Aborigine in his party). They spent Christmas Day 1844 feasting on cockatoo and suet pudding on the shores of Brown Lagoon. While camping alongside the river Leichhardt sighted a comet and named the river Comet Creek (which was later renamed Comet River). By 1860 Christopher Rolleston had selected ten blocks in the Leichhardt District. Initially the pastoralists raised sheep, rather than cattle. In the early part of this century the native spear grasses took control which forced many of the stations to turn to cattle. A part of this pastoral history were the notorious Patrick and James Kenniff - legends as Queensland's last bush rangers. Also ask about the Reliance Co-operative Society that existed. late last century. 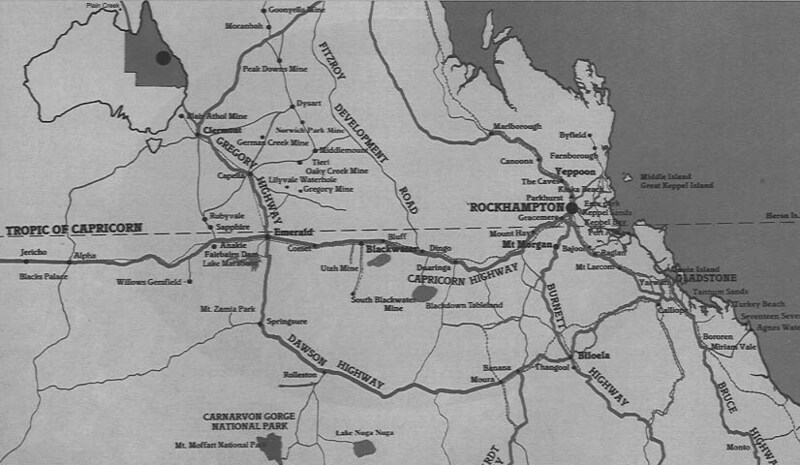 OUR TOWN - In 1862 a Cornishman, John Trigillgus built a hotel near the crossing of the Brown River to provide a resting place for carriers travelling from Rockhampton to the west. In 1863 pastoralists Cameron and Sheridan applied for a pre-emptive right of purchase of the land at the crossing which they were going to incorporate into the property Planet Downs. Local residents protested and in 1863 petitioned the Governor, Sir George Bowen. In March 1864 the new proprietors of the public house, Messrs Henriques and Co added their weight to the cause. Consequently the town was surveyed by the Surveyor General, Augustus Gregory who on May 25 1865 submitted the details of the new township to the governor for his approval. The town known then as Brown Town was to be called Rolleston after the pastoralist Christopher Rolleston. By 1871 Rolleston had a population of 30 persons, several residences, an unofficial Post Office and a provisional school with nine pupils enrolled, and Frank Nicholson as the first principal. In 1996 the town celebrated 125 years of education with a big Back to Rolleston gala weekend. ATTRACTIONS - Rolleston is the closest town to the magnificent Carnarvon Gorge, one of the most beautiful National Parks in Queensland. Also a new National Park, Albinia, runs nearly to the town. Not far away too is the splendid Arcadia Valley in which lies the unusual Lake Nuga Nuga. The lake supposedly went dry overnight during World War II. Much of the land in the Valley was balloted and sold during the Brigalow Scheme of the 1960's. Near the town is the site of a fatal air crash in the 1930's and on the road to the Gorge you pass by where a WWII plane crashed killing all aboard. Recently Rolleston was to be shifted owing to the plan to build a dam. Another Tallangatta (Vic) in the making. However the RDWP sign hanging outside the old newsagency is all there is to remind people. The water would have reached Hodgson's Store. Not far below Rolleston is the historical "Big Water Hole" where Leichhardt probably camped and was the scene of a big Aborigine Camp as described by Vic Priddle in "Dung On His Boots". At first glance there does not seem to be much to Rolleston but scratch below the surface, talk to the locals, particularly the old settlers, and many interesting snippets of information come to the fore. Rolleston State School has a website https://rollestoss.eq.edu.au/Pages/default.aspx . Rolleston is a small village on the Comet Rover in Bauhinia Shire in Queensland. Bauhinia Shire is about the size of Belgium, but with a total population of only 2,600. The main centre of population is Springsure, (950), and Rolleston is the second largest with 130 people. The economy of Bauhinia Shire is based on agriculture, (beef cattle, sorghum, sunflowers and cotton), with some coal mining and natural gas fields. The shire has some important National Parks, including Minerva Hills with Aboriginal rock art as well as kangaroos, wallaroos and wallabies; Ka Ka Mundi with eucalyptus trees and koalas; and Salvator Rosa with bloodwood and ironbark trees as well as a wide variety of wild birds. Aboriginal-European war is the stone fort at Rainworth Station. The first European to "discover" what is now Rolleston was Ludwig Leichhardt. He spent Christmas Day 1844 feasting on cockatoo and suet pudding on the shores of Brown Lagoon, called after an Aborigine in the party, Harry Brown who first sighted it; indeed the original name of Rolleston was Brown Town. The Comet Rover was called after a comet Leichhardt saw there. A small settlement grew up and in 1863 the residents petitioned the Governor to proclaim the area a township and approval was given in 1865. The new township was called after Christopher Rolleston, a pastoralist who was Land Commissioner of the Darling Downs, Private Secretary to the Governor, Registrar General and Auditor General. He was also on the Boards of the European Assurance Society, the Mercantile Gas Company, as well as Vice President of the Bank of NSW. He was a prominent Anglican lay preacher, a magistrate and a member of the Senate of the University of Sydney. At the end of the 19th century nearly all the rural land was taken up by the enormous pastoral empires in the hands of a few wealthy landowners. The stations were largely self-sufficient, supplies being bought in by teamsters once or twice a year. This went on until the introduction of motor trucks in the late 1930s, and even today many minor roads are impassable in wet weather. As well as employing Aborigines, pastoralists also used Chinese labourers who were not allowed to own land. Chinese, and later Indians, became hawkers, carrying goods from Springsure to Rolleston. In the early years of the 20th century, spear grass invaded the sheep pastures to such an extent that sheep became uneconomical and were replaced by cattle; in spite of crippling droughts in 1902 and 1913, by 1923 Consuelo Station near Rolleston had between 25,000 and 30,000 head of cattle. As well as droughts and consequent fires, the Rolleston area sometimes suffers from devastating floods, the last being in 1956. Other problems for farmers include dingoes, which prey on their stock, and prickly pear cactus. Dingoes were originally controlled by strychnine poisoning and by hunting for their fur, which, together with the skins of opossums and koalas, provided a good living for trappers. In 1909 a trapper, in three weeks, could earn more the equivalent of a bank clerk's annual salary. In the last possum season in 1936 one man made £300, enough to buy a property; since then possums have been protected. The numbers of dingoes was greatly reduced by disease in the 1920s. Prickly pear was a serious problem at the end of the 19th century and by 1925 it was spreading through Queensland and New South Wales at a rate of million acres a year and had already covered 58 million acres. It was finally controlled by the Cactoblastis grub in 1927. Another problem plant is the brigalow, a type of acacia. Cattle hide in brigalow scrub, making it difficult for the stockmen to round them up. Clearing the brigalow with axes was not cost-effective, so it was not until the late 1940s, when tractors and bulldozers were introduced that large scrub clearance became possible. In the 1960s blocks of land between 7,000 and 18,000 acres each in the Rolleston area were allocated by ballot. Applicants had to have guaranteed assets and had to take up residence within three months of the allocation. Loans were available under very strict conditions which included a duty to clear, fence and stock the land and to provide watering and dipping facilities. Most of the ballots were drawn by married couples with children; this increased the use of the school, the church and the community hall and sports grounds. Once the ground was cleared, it became highly productive beef-producing land. In 1960 the Country Women's Association (CWA), an organisation rather like the WI, launched a fund to build a medical centre, as the doctor on his monthly visits had to use the inadequate School of Arts building. The money was quickly raised by dances, and sports days and from cattle donated to the fund. The main objective of the CWA is to help women cope with the problems of country living through education and social activities, but it also raises funds for clinics, emergency hospitals and seaside holiday homes for women and children. In Rolleston, the CWA hall includes a medical centre, a sports pavilion, showers and toilets. Electricity arrived in Rolleston in 1971, and by 1985 all properties were connected. A swimming pool was built in 1991 and present-day Rolleston has a 1000 metre gravel airstrip, a sports field and tennis courts. Perhaps the most notorious local characters were Patrick and James Kenniff, the last of Queenslands bush rangers. Originally stockmen and trappers, in 1900 they turned to horse stealing and cattle "duffing" (rustling). In 1902 a station manager and constable set off in pursuit; their charred remains were found at the head of Meteor Creek, presumed shot and burned by the Kenniffs, who evaded capture for a further three months. Patrick was hanged and Jimmy sentenced to life imprisonment. Schooling was irregular in Rolleston until a new headmaster, Daniel Keating, revitalised it in 1902. Under his guidance, the school developed a very successful gardening project, despite marauding goats and pigs. The number of school pupils increased until the building had to be extended in 1925; a new school was built in 1964. The present police station was built of timber in 1919 to replace the old station, which was "white-ant eaten and undermined with dry rot and decay". As Rolleston was largely settled by people of British origin, the church of England was soon established, and in 1886 Rolleston became part of Springsure Parish. From 1888 to 1904, Rev. John Hunt travelled about his parish on horseback, covering the whole area every three weeks. Church services were irregular, as roads were poor and travel depended upon the weather. They were held in private houses or in the school until all Saints church was built by local volunteer labour, organised by Rev. Pike who established a sawmill and cut the timber himself. The church, which was opened in 1934, was painted on the outside by the men and inside by the women. Gifts to the church included the organ, the font, the lectern and the Bishop's chair; the chalice was given by All Saints Church in Bristol, England. St. Theresa's Roman Catholic Church was built in 1952 at a cost of £300 by two Northern Irish brothers, the land and the timber having been donated. Rolleston also has a small group of Presbyterians who meet in private houses, and an Assembly of God congregation, which meets in the Memorial Hall. All Saints Church is in the Anglican Parish of Springsure in the Diocese of Rockhampton. The Rector, Rev Rod Hart, lives in Springsure but hold services in Rolleston or in surrounding homesteads twice a month. It is quite remarkable that such a small, isolated community, with the support of families from the outlying grazing and farming families, manages to maintain such a large and beautiful church. The church was built in 1934 under the supervision of the then Rector, Rev. E.J.B. Pike, who came originally from Fishponds, Bristol, England. It is built on a cruciform plan with an apical Baptistry. The main structure is of local timber from surrounding homesteads, given by their owners and cut in a sawmill established by Rev. Pike who also cut the beefwood timber for the pews. The exterior walls are of painted cypress pine. The interior is plastered and has gilt plaster mouldings running round the walls. There are gilt cherubim on the Sanctuary columns. The three stained glass windows above the Altar were designed by Rev. Hamer Howarth and installed in 1980 to replace the original plain glass. The central window, between two abstract designs, depicts the ascended Christ. At the western end, over the font, is a rose coloured window in the shape of a Maltese cross. The silver chalice, which is used in the Communion Service, is inscribed: "To All Saints Church, Rolleston, from All Saints Church, Fishponds, Bristol, England". This was the church that Rev. E.J.B. Pike attended as a child. Mrs Allison Ogg, who supplied much of the information about the Church wrote: "The loving and devoted service given by our parishioners over the years has created a wonderful atmosphere of peace, love and joy for all who visit our lovely Church of All Saints".